Incorporate these four tips into your apartment to make it feel more relaxing! Life can get extremely busy, but it’s important for everyone to try to find some time for themselves and relax. Your apartment should be your safe space on those days when you need to take a breather and unwind and should leave you feeling peaceful rather than stressed out. If your apartment isn’t giving you the comfort you need, continue reading for some ways to transform your apartment into a relaxing and healthy space. 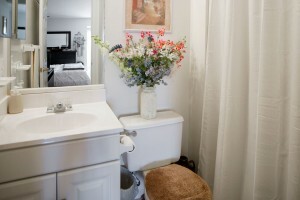 Flowers and plants are great for creating a relaxing atmosphere, are they are both visually and aromatically soothing. Nature of any kind (that you can take care of) makes any home feel more calm, as the plants help to clean and oxygenate the air. Aromatherapy is a trend for a reason- the scent of your home is essential for a relaxing space. In addition to nice smelling flowers and plants, candles are an easy way to bring in a calming scent and immediately make you feel more relaxed. Also, the soft, warm light of a candle is great for de-stressing, especially while reading or book or taking a warm bath. Another great way to feel at ease in your apartment is to decorate with things that bring you happiness, such as photographs of fond memories and artwork that makes you smile. Allowing yourself to step into a home that makes you smile and feel good is the best way to have a positive reaction to your apartment. Sleeping with old pillows or sheets can be uncomfortable, and could be resulting in low quality sleep. While you don’t need to purchase the most expensive items for your bed, it should be the most comfortable place in your home. You spend the majority of your time in bed and sleep is so important for your health, so investing in a quality mattress, pillow, and soft sheets is like investing in your happiness and overall well-being. This entry was posted on Friday, February 9th, 2018	at 10:45 am	. Both comments and pings are currently closed.